If things go to plan, Irwindale Speedway won’t be around long enough to see its 20th year in operation. Like too many other tracks in California, the speedway will become the state’s newest 700,000-square-foot mall after it closes on Jan. 31, 2018. Employees at Irwindale weren’t expecting it to happen so soon. The San Gabriel Valley Tribune reports that a development company bought the track in 2013, two years after the speedway’s operator declared bankruptcy. The track’s website still calls it a “brand-new, state-of-the-art, motorsports [and] entertainment event facility,” and the Tribune reports that the developer said it would allow racing to continue there until construction began on newer and more state-of-the-art mall. While it might not be as brand new as its website makes it out to be, Irwindale is a fairly young track. 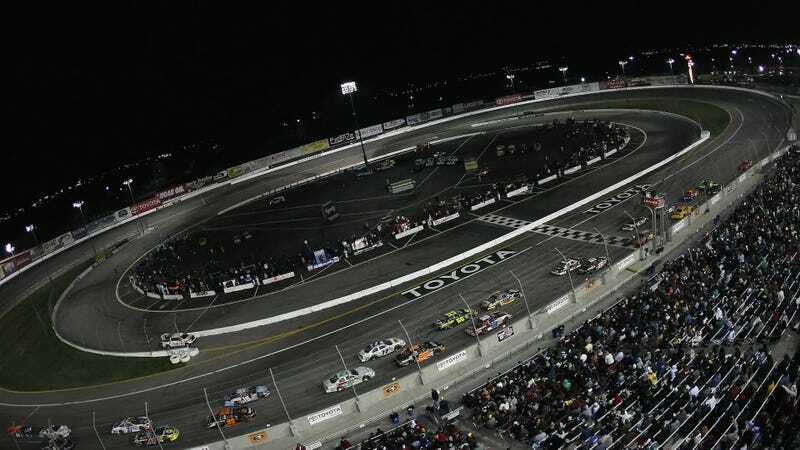 The Tribune reports that it came around in 1999 after a racing hiatus of two decades in the Irwindale, California area, which the Tribune says has had five different racing facilities. Things didn’t start out well at Irwindale, with the Los Angeles Times reporting that the first fatal wreck at the speedway happened opening day on March 27, 1999 when a driver named Casey Diemert, 23, crashed his sprint car in practice. A later LA Times column, which will quickly turn your day somber, claimed that Diemert’s death wasn’t announced when all the fans arrived a few hours later. Most read about it in the paper the next day, the column said, and the director of communication at the track reportedly told the LA Times there was “no need to say anything that night” because the crash happened before the crowd came. Three more drivers died between then and June of 2002, the LA Times reported. The track currently has a banked half-mile oval and a one-third-mile oval in use, according to its website. It also has parking for more than 3,000 cars and seating for 6,000, as well as 12 suites. In the past ten years motorsports has enjoyed phenomenal success and growth across the country ... While, at the same time, the Los Angeles area lost its last 1/2-Mile oval short track in 1990. Irwindale Event Center is committed to bringing all the action, color, and excitement of close-up, paved oval racing back to Southern California. It did do that, for a few years. Local racing, major drifting events and NASCAR’s feeder K&N Pro Series West series all raced out there. The K&N Pro Series ran a doubleheader at Irwindale in March of this year. Irwindale Speedway’s operator, Irwindale Speedway LLC, filed for bankruptcy in 2011, stopping racing altogether at the track. Motor Authority reported at the time that track owner Nu-Way Industries was on a search for a new operator for the track, and decided on Team 211 Entertainment at the end of 2012. The company doesn’t have much of an online presence, but its records in California say that it does event management and officially registered as a company in May of 2012. Curbed reported a few years ago that a developer bought the track at the end of Team 211’s first full year of managing events at the speedway, around October of 2013. The developer, Lindom Company, announced that it planned to pave over the 63.5-acre piece of land with a “project,” but didn’t give details about what that was. Lindom said racing would continue through December of 2014. Racing continued for a lot longer than that, if there are any positives to take away from the news that another race track will soon become a huge mall. Even still, the announcement was so unexpected that Team 211 was already working on plans for events past the newly announced closure date. But it won’t be hard on the shoppers, or the bulldozers coming in to uproot the entire thing. Irwindale will be nothing more than a memory, slowly fading as each new generation files into the stores for another year of the latest fashion trends. What a sad, unfortunate way to go. Update, Aug. 11 at 8:48 a.m. ET: Irwindale’s Vice President of Communications, Doug Stokes, responded to Jalopnik with some comments about what a great run it had. He also included the lovely photo you see underneath his comments with the email. What a cool dude. Yeah, the other shoe, after 5 years, has dropped, and we’ve been given a firm (01.31.18) vacate date. I’ve been told that the Outlet Mall plan has been scotched; but really don’t know what the “official” plans are for the property … an easy (and in my case uneducated) guess is something of an industrial nature. In all seriousness (which I can only maintain on a momentary basis) the team here did their best to put on a great show every time that we opened the front gates. Working under one of Damocles’ sabers was never a easy nor healthful deal anywhere anytime … having to constantly indicate that we were still here and operating was tiring. Expecting this news was always out there in the fog just beyond the property line. Why Penske did not buy Saturn (at a fire sale price) is beyond me … Spring Hill would have made a great condo complex. Me? I’m going to take up spelunking (I’m starting small with the crawl space under my house, but have full expectations of Jalopnik carrying some of my personal tales of adventure as I progress to deeper and darker places).